Shiv Desai, right, with Acting Library Director Steve Laughin, left. We would like to thank everyone who came out to participate in the library's open house earlier this semester! We're really excited to be able to offer these new study spaces, and we hope that you all will enjoy using them. We'd also like to recognize our grand prize raffle winner, Shiv Desai! Shiv won an autographed photo of himself with General Krulak, a copy of which will be held in the BSC Archives. Congratulations, Shiv! This weekend is the commemoration of the 50th anniversary of "Bloody Sunday" and the Selma-to-Montgomery march for voting rights. BSC's own One-A-Chord Gospel Choir will be part of a huge choir that is scheduled to sing this weekend at the celebration in Selma. They will perform a variety of traditional Gospel pieces as well songs and hymns made famous during the Civil Rights era. The program also includes contemporary music chosen especially for this 50th anniversary. 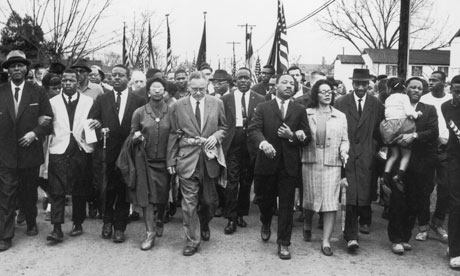 Martin Luther King and his wife Coretta Scott King lead a black voting rights march from Selma, Alabama to the state capital in Montgomery a few weeks after "Bloody Sunday" in March, 1965.